Kajjali, Swarna Bhasma, Moti Bhasma, Shankha Bhasma& Tankan. 1/4 th to Tab.1 Tab.with madhu or butter or sugar twice a day. Alterative, tonic & stimulant. 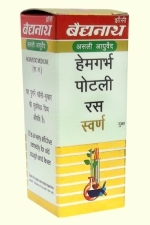 Used in anaemia, cough & chronic diseases of heart & general deblity, Tridosha.